In the category of "last posts", I hope for this to be my last Lenten-related post until closer to Easter. I really feel that continually announcing to the world what I am doing for Lent defeats at least part of the purpose... after all, there is to be humility involved as well. Each year, I like to take what I have done in the past and build on it. Basically, I take a look at the things I have given up in past years, evaluate how it turned out, and decide whether or not to try it again. And then I like to add something new. Last year, I gave up all TV except for The West Wing. I knew if I banned TWW, I would never last-- I would fall at the first test. What is funny to me is that TV was never an issue for me before. I never watched enough TV to justify giving it up, until we had lived in free-cableville for about a year. Then, I discovered what everyone else has been on about my whole life. I am so addicted to TV. This year I am making no exceptions to the no-TV rule. I have had withdrawl for a week (to the point that I had a CSI dream last night). But this, too, shall pass. And what did I replace TV with last year? Computer games. I spent hours every night playing Age of Empires. (Feel free to laugh.) And, as you may have noticed, totally defeated my own purpose in giving up TV. So this time around, I've limited my computer time. So far, so good. What is the point of all this? Drawing closer to God. It's amazing how much time is suddenly freed up for prayer and Bible study when other options are closed off. It gives me hope that I am not so addicted to TV and internet that I will neglect my children; God has given me the capability to recognise the better things. All week long I've been praying for God to open my eyes to the real world and the real needs around me, and free my brain from the grip the television currently holds on it. Our God is good; he knows what I need. That is what Lent is about for me. I wanted to post an update on our adoption process, probably the last one for a while, because we've entered a rather slow phase! Our paperwork is almost ready to be turned in, in fact we hope to have it done this week. After that it is a matter of getting other things done as we have room in our budget, so we do not expect to be ready for our homestudy phase until May at the earliest. From all accounts, the homestudy phase is what takes the longest. I have pretty much abandoned all hope of having children by the end of the summer, although we are still thinking end of the year. For now, we're praying for that. We've also had a rash of bad news from various sources lately, so we're hoping for better news today. About anything. And finally, I have pictures posted here of some quilts that I am so very proud of. My entire photo blog is here. I worry about my dreams sometimes. Actually, it would probably be more accurate to say I worry about the brain that produces such dreams. I dream very vividly, I usually remember my dreams the next day (and some, years later), and there are times when I have a hard time separating what I dreamed from reality. So last night my dream was nothing spectacular. A friend from church came over to help us pack to go to Scotland (just for a visit, I think). It ended up she and I talking while Chad did all the packing (which, by the way, is probably what would happen in real life as well). This is a friend I dream about frequently, and I particularly enjoy telling her about such dreams because she does freak out just a bit that I'm dreaming about her. All my assurances that I dream about everyone I know have fallen on paranoid ears, so far. And it didn't help the time I added, "I dream about your husband and kids, too!" So, why not have some fun where I can get it, I say. The only odd thing about the dream was that after Chad got us all packed up, she drove us to the train station. Presumably, the train we got on was taking us to an airport, because there is no train that will go to Scotland from here. What else this week... a few nights ago I dreamed that someone came into our house during the night, and I'm surprised I didn't wake Chad up in real life trying to wake him up in my dream. I woke myself up, though, because my hand was really tapping his, trying to wake him up. Another night I went to a concert with my brother and sister to hear a band from Glasgow, who for some reason was playing in Lubbock. (No explanation for that, or for what brought my siblings to Lubbock, either.) I dreamed about turning in my peer reviews, and then woke up thinking I had done it already. And the best one this week: a bakery chain from the U.K. (Gregg's, for those who are wondering) opened a store in Lubbock. I was really depressed when I woke up from that one. In the midst of my pondering today I also remembered some other dreams that are permanently filed away: getting lost in Glasgow, crashing into a friend's car, one of my friends being kidnapped, having a huge argument with some dear friends, an accident (not my own) while mountain climbing, forgetting a speech, working in the White House (TWW-induced), being shot at by my aim assistant (not sure what brought that on), running for my life while carrying an injured friend (that one was LOTR-induced), being chased through Glasgow by an angry coordinator (I have to say that is one of my favourites-- his, too, I think), and last but not least, most of my family has died at least once. The last ones may be a relief to wake up from, but all is not pleasant in the waking, because if I cry in a dream, then I'm crying in my sleep, too, so I'll wake up with a swollen face. I walked to work this morning, just because I could. :) Seriously I wanted to ride my bike, but what with conflicting weather reports about expected wind I decided not to take anything with me that couldn't easily be brought back home again if the wind were to pick up. And as my husband never tires of reminding me, my balance is bad enough in pristine conditions. Adding high winds to the mix is a recipe for disaster. I stayed home the last couple of nights to do "peer reviews" for work, and it was miserable. Fortunately, they are done, turned in, and off my plate. Now I just have to wait for my own performance review to see if my coworkers all wrote variations on, "Su is kind of funny but she's a jerk." We were asked to be frank with our reviews, but I couldn't bring myself to write much that was negative about anyone else. The main reason is, I work with an amazing group of people. There is no one in that office that is not absolutely fantastic at what he/she does. So it is hard to come up with areas for improvement. Reason number two: even if said coworker does get on my last nerve, that does not affect his/her job performance. Or mine. Anyway. I have Bible bowl questions to write, CPS paperwork to fill out, a quilt to, well, quilt, a blanket to finish crocheting (preferably before the baby is six months old! ), two more crochet projects to start, a couple of cross-stitch projects that likewise need starting... Oh, dear. If only everyone I know (including us, I suppose) wouldn't insist upon having children at once. Actually I wanted to share how my Ash Wednesday went. First day of Lent and already I'm missing the television (I even checked my calendar this morning to make sure Lent is, indeed, six weeks long). I unplugged it earlier, to cut down on ease of turning it on in moments of frustration/temptation/both. So now I can't just push a button; I have to crawl around the back, fish out the cord, plug it into the power strip-- and in the time it takes to do all that, I can probably find something else to do. I have also gone over my internet time limit, but since I just finished working on a project for work, I do have a bit of an excuse there. Also, for the second hit Ash Wednesday in row, we had a catered luncheon today, which I abstained from due to that whole fasting thing. I wasn't the only one, either; Catholics all over the building were heard to bemoan the silliness of someone bringing us lunch on Ash Wednesday. It was a rough day for all of us. :) That's not really true, of course. I don't know what everyone else did, but I have found that avoiding the kitchen is a good way to avoid any food that may be hiding there. So my fast day wasn't so hard after all. Last year I set out to fast on Wednesdays throughout Lent, and made it about halfway before giving in. This year I am giving myself some help by having meal replacement shakes on those days; not true fasting, of course, but better than caving halfway through. Plus since I do have blood sugar issues (or something) this keeps me from passing out at three o'clock. I have no real objections to passing out at work, after all it does liven up the day for everyone else, but I do have a problem with someone hooking me up to an IV of something afterwards. And I am kind of afraid that might happen. A few nights ago I went a bit mental on blogspot (and a few other places, too, as it turns out) and ended up "visiting" people I haven't seen in real life since... well, it's been well over a year for all of them... and some are more like five years. So, I collected a bunch of URLs and plugged them into my link list in the sidebar. This is mainly so that I remember to visit them, since the traffic on here is so minimal as to justify taking out the stoplight and replacing it with a stop sign. In one direction only. Anyway, by means of disclaimer (since I was very rude and didn't bother asking): if I added someone who does not want to be on my link list, let me know and I will remove you. So then I get to the "can't escape myself" part: What order do I put everyone in? The order I found their blogs? The order I met them? (If I did that, my husband may be last.) How well I like them? Age? Gender? Distance from me? Okay, that is exaggerating a bit, but I did actually spend about five minutes of my life thinking about this. And that's five minutes I'll never get back. (TWW reference, in case anyone missed it.) And so Blogger led me to a very simple conclusion: Alphabetical! How silly of me not to think of it! With one (okay, four) small exception: The people who have always been at the top are still at the top. I can't relegate my most loyal readers to anywhere else in the list. Yes, two posts in one day, can you believe it? I'm posting again not because I have nothing else to do (stack right here on the desk next to me and in the other room-- you guessed it-- another stack! ), but because as Lent begins I like to take some time to reflect and where better to do that than right here on the internet where anyone can read it, right? Firstly, lest anyone freak out, let me state that I have celebrated Lent for most of my life. Okay, really just over half, but 51% is all that is required to be elected president, so I'm calling it most. All through Junior High, all through High School, during my aim years-- you get the picture. People who know me really, really well don't know this about me; well, the secret is out now, isn't it? The reactions I have received to this little bit of my life throughout the years have ranged from a mildly interested, "Why?" to a panic-stricken, oh-Su-has-fallen-away, "WHY?!?!?!" I'm not going in to all my reasons now; if you really want to know, ask and I'll tell you. So, Lent! I posted a couple of things a few months ago that are coming with me into the next six weeks: Firstly, that the internet is sucking hours from my life; secondly, my thoughts on the song So This is Christmas. We'll go with the second one first-- I looked back at the old year and saw some things that needed to change. (And without blasting my own trumpet too much, I am pleased to say that some things have changed in the last couple of months.) And as for the first one-- internet, TV, and other mindless media have united to keep me from the important things. So, for the season of Lent, I will abstain from the television. And limit my time on the internet to one hour every day. And how will I fill all this newfound spare time? People. Bible. Prayer. Encouraging others, filling up, communing with the Saviour. This is not everything I've been thinking about, but it is a start. And all that I am willing to share on the internet. I got up early this morning-- no, not really. I got up on time this morning. I usually get up late, so "on time" feels like "early". So I am now sitting here, writing a blog post and eating my pancakes. We eat pancakes so rarely, saving them for Pancake Day and maybe Christmas or Thanksgiving, that they are in the nature of a treat. I'm sure that someday I will feel like a bad mother if I make my children eat pancakes from a mix, so I suppose I should learn how to make them from scratch before getting to that juncture. But for Chad and I, a mix is fine. So I'm feeling a bit iffy about eating pancakes with syrup only days after ranting about the obesity epidemic; bit rich coming from me, eh? I had more time to think this over yesterday while walking home from work. My issue isn't being overweight; my issue is giving up the battle. I've been overweight most of my life, and every pound that comes off is a fight. A few times in recent years it has seemed that I was inches (hee hee, no pun intended) away from having my weight under control, only to see it slip away from me again. But I have to fight this battle; I must be in charge of my own health; I have no choice. Heart disease has run rampant through my family, we've had our share of cancers, and more recently, as the latecomer to the party, diabetes has popped up as well. My genetics are against me; to give up the battle is to give up all hope of seeing my children and grandchildren grow up. Which naturally brings me round to the serious section (more serious?) of this post. There are many, many parallels between my struggle with my weight and my spritual life. Every sin is a fight; every good habit established is countered by another setback. Some days I feel like I am making headway, and some days I am content to live to fight another day. And there are times when I am ready to say, "Forget it. Sorry, God, can't do this any longer." But since I am with me all the time, a victory in one area gives the stimulus to go on in the other. If I can get up 30 minutes early to read my Bible, then I can refuse seconds. If I can skip that chocolate bar, then it is easy to spend 10 more minutes praying. Stopping to offer a word of encouragement to a co-worker makes 20 minutes of exercise seem lighter. And so on. Now if only I knew the spiritual equivalent of pancakes. So I was driving home just a few minutes ago, and I thought to myself, "Why was this ever hard?" Driving a standard is as natural as an automatic now. Thank goodness. This Tuesday is our last pre-adoption training class (Halelujah!). I know the classes are important, we are getting valuable information, etc., but I'm really glad we won't have to go any longer. It will be very nice to have our Tuesday evenings back. Lest anyone think we are close to getting children, let me correct you by saying we still have paperwork, fingerprinting, home visits, and probably some stuff I haven't yet thought of to get through. We still have quite a way to go. And now for my main topic: I drove home yesterday after taking Chad to work, and I was distressed to see people flocking into every high-fat, high-carb, high-calorie, low-nutrient restaurant in sight. The obesity epidemic is well-publicised, well-hyped, and well-known throughout America, and the dangers that come with obesity are very real, and yet so many people aren't even trying. Why must people who are already overweight insist upon driving to a nasty fast-food restaurant, circling the car park for the closest spot, and waddling in to load up on more junk? I'm not opposed to enjoying one's food, nor to eating out on occasion, but there are people who don't even bother to take charge of their own health. Or perhaps I have it wrong. Maybe this is their way of taking charge; the "I'll do what I want with my own life" attitude that has no regard for the fact that you won't have a life with which to do anything if you keep this up. Or regard for those who care about you. Or for the Medicare system, that someday will be obliged to pay your medical bills, should you manage to be with us that long. Okay, so that was a nice little rant, but I had to get it out of my system. In other news, I was back on my bicycle yesterday for the first time in a few months. I now have flat-proof tires on both wheels, which means I can ride anywhere without worrying about picking up thorns, broken glass, or whatnot, but it also adds to the drag and means I have to work harder. We took a short trip to the library, about three miles total, and that was enough work in itself for one day. It is almost hard to believe that last summer I was riding four miles one way, but I was more in condition then. So that's what I need to get back to, I suppose. The wind was also unfriendly to us yesterday, but then that is part of life here. I realise that I say this in the same way that I would say the TV characters are my pals, or celebrities, athletes, etc., but there is a difference. Firstly, unlike the TV characters, Tabitha was an actual person. And while I've never met her, she is also my sister in Christ, so one day I will. Now in Joppa there was a disciple named Tabitha...; this woman was abounding with deeds of kindness and charity which she continually did. And it happened at that time that she fell sick and died; and when they had washed her body, they laid it in an upper room...When (Peter) arrived, they brought him into the upper room; and all the widows stood beside him, weeping and showing all the tunics and garments that Tabitha used to make while she was with them. Of course, the next part of the story is that Peter raises Tabitha from the dead, and many people hear about it and believe in the Lord. But these verses sum up what I mean. God has given me the ability to make things, to be kind to others, and (when I am paying attention) to see needs before they are expressed. About eight months ago I decided that, while making baby and wedding gifts for my friends is well and good (and also lots of fun), there is a good chance that God has given me this ability for greater purposes that filling my friends' houses with more stuff. Tabitha made useful things for people; she saw needs and filled them continually. Unfortunately, I managed to get caught up in a flurry of new baby and wedding (not to mention Christmas) gifts in the eight months since this decision, so thus far I have made no move toward deeds of kindness and charity, nor toward making useful things for people who do not have them. This is probably the juncture to mention that I am also uncertain how to begin; after all, my expertise lies in crocheted baby blankets and cute little cross-stitched designs with names and dates on them. Time to pay attention to what is happening around me. Lots of things on my mind this week.. so there is no telling where this post may lead. For our Valentine's evening, we watched a movie; Superman Returns. I have never been much of a Super fan, to be quite honest; I remember snippets of the Super movies, and was a faithful devotee of Lois and Clark, but in terms of the Super comics or the Super story, I am pretty much in the dark. Even being a recent Smallville fan hasn't helped much, because that show 1) relies on the Super viewers to know the story already, and 2) has the Super artistic license to go its own way. So, all that said, I enjoyed Superman Returns. My particular item of fancy with this movie was the 1940s-esqness in terms of scenery, costumes, and so on, tied with modern-day gadgets and whatnot. This may/may not be an established part of the Super genre (and how would I know? ), but I was quite taken with it. Josh: These people (on an internet message board) are crazy, Donna. Donna: I told they were hysterical, Josh. Josh: I thought you meant they were really funny. That may not be 100% accurate, but it is as close as I can get without bothering to look it up. We went to Market Street (supermarket) this evening because I needed to eat and we are sadly lacking in supper-type food at the moment. Anyone who likes oatmeal, come on over. We have plenty of that. Anyway, since we live three blocks from the supermarket, we usually walk or cycle over, and therefore tend to get smaller amounts of food than people who come in their cars. And naturally, we are there a lot more often. I have been thinking lately that it is remarkably convenient to be known, by name, by most of their staff: "Good morning, Su, how's Chad? We saved you some oatmeal on aisle 12." Actually it is more like, "Oh, hello, Chad. Is this your wife?" since he is there more than I am. Chad can make an entire meal out of whatever food is being handed out in samples on any given day. Market Street must be losing money on us, because while we always try the samples, we rarely buy the product thus being promoted. To quote Terry Prachett, my mind wanders so often it comes back with souveniers, and the final thought I was going to share is now gone, alas. Perhaps it will come home soon. Charlie very kindly linked to my blog from his own (far superior) blog, so now I feel obliged to say something intelligent. Yikes... taking the stage... all eyes on me... what shall I say??? Well, maybe I'll start with a confession of sorts. I stepped out of Bible bowl a few weeks ago. Why? I did some soul-searching and realised that I was doing it because I wanted to win. And I could, no problem. God has blessed me with an excellent memory and a gift for retaining what I read, so all I had to do to come home with another ribbon was read a couple of chapters every day for the next three months. Nae bother. I had grand visions of standing on the stage, holding my blue ribbon, while my friends took pictures (which would be displayed during the announcements at church the next day, naturally!). I rationalised such ideas by thinking, "Wouldn't it be great if I could recite the whole of Acts from memory?" Again, God has given me the ability to do so. And as a final (un)convincing argument, I even reasoned, "This is the last year I can do it-- next year we'll have children and I won't be able to go." Also true. In the end, all justification aside, I came to the conclusion that winning a blue ribbon was not an acceptable reason for Bible study. Maybe it is for children (although I am not too excited about that, either), but for a woman who has been in Christ for 12 years, it is awful. I enjoy Bible study, I enjoy reading the Bible just for the sake of reading it, I enjoy discussing it with other people. I don't need a ribbon for that. I've developed a new addiction. Not for drugs, alcohol, exercise, or even an exotic food I found at Market Street (that last one is Chad's department, anyway). To begin, I must go back a bit: Faithful readers, or those lucky enough to be around me on a regular basis, may remember my love for The West Wing. Jed, Leo, Josh, Sam, Donna, Toby, and especially C.J.-- they were all my pals for a couple of years. (So much so that my boss, who along with his wife, shares my love for TWW, started calling me C.J. for a while. No nickname could possibly have been more ill-suited than that one.) So I was distraught that fateful day last May when my pals left the air forever, and I have not found a show to replace it. Until now! Shortly before we moved last November, I started watching CSI: Miami, because the good people over at A&E were doing for CSI: M (doesn't abbreviate quite as well) what the nice folks at Bravo did for TWW for so long-- played it constantly so that newbies to the show could catch up. Then we moved and lost our free cable, and I've only recently been moved to try to find my new fix. And now I'm hooked. It's quite a jump, really; I liked TWW because it was a witty, intelligent, well-written show with likeable cast. CSI: M has all those things apart from wit, intelligence, and good writing. Yeah, so I'm drawn to a likeable cast. Why else would I like Scrubs, M*A*S*H, Stargate, or Friends? With this in mind, I wandered over to Television without Pity last night, a snarky website that recaps some of TV's most popular shows, celebrating the triumphs and lampooning the failures. Unfortunately, in the eyes of the nice people at TWoP, CSI: M is one of the failures, so it only has one season of recaps, but they are some funny ones. If you would like to see if your favourite show is currently being made fun of, click here. So that is the sum total of my thoughts for today. If you still haven't been to Chad's site, trot on over; the link is in the sidebar. 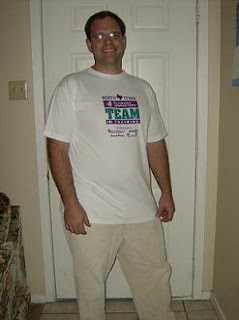 So here we have my husband, proudly sporting his new "Team in Training" t-shirt. He is running a half-marathon in May as part of the Leukemia and Lymphoma Society team, to raise money for treatment and cure for these diseases. His fundraising goal is $5000; a link to his site where you can donate is in the sidebar. If you have a spare $5 you can give to this cause, we would be so grateful! And so would the thousands of patients who depend upon the efforts of organisations such as the Leukemia and Lymphoma Society. This is going to be another one of those times when everyone thinks I've gone mad. Now I like the Super Bowl, right, but most years I like it because it brings the American football season to a close. I do not like American football-- it bores me to tears. Please don't bother telling me how it is actually more interesting than any sport I like. I've tried it-- it does not appeal. Having said that, I have been a fringe Colts fan my whole life. By which I mean, I check the score the day after they play, and read the occasional article. So I was delighed two Mondays ago to see in the paper that the Colts will be playing in the Super Bowl! More reason to like it, I say! In celebration of said occasion, I will be decking myself out for the party with our Bible study group. I have blue and white ribbons for my hair, I'm hoping to find some blue face paint cheaply somewhere tomorrow, and if I truly go off the deep end, I may buy some cheap Kool-Ade and dye my hair blue with it. If anyone reading would care to loan me some blue nail polish, I would appreciate it. This will be the first-- and, unless I am taken over by the pod people sometime in the next year, last-- time that I put this much effort into a football game. And after all those preparations, I will probably spend the game doing hair wraps on little girls, or otherwise playing with the kids. Did you read my first paragraph? American football is boring! I've had a revelation recently. I've always enjoyed writing, ever since I was very young, and in fact for many years I thought writing would one day be my career. And I do still write regularly, even though I have more or less moved away from the idea of ever being published; my writing these days is for myself (and a little bit on my blog!). So here's the revelation: I do not actually have a writing style. All those years in school when my teachers were agog at the writing I was producing, they were really agog at someone else. Not that I was plagarising, of course; but I do tend to absorb the style of whoever I'm currently reading. When I look back and re-read things I've written in the past, I can see that. In primary school, it was Laura Wilder; in high school, I was more influenced by speakers and teachers I knew well. In my adult life, there have been three main influences: Elinor Brent-Dyer, Terry Prachett, and J.K. Rowling. In fact, the things that I re-read that are the most "mine" are the ones I like the least! What to do now? Well, I am not going to give up writing, certainly, although this does serve to confirm that getting published is probably a no-go for me, at least for the immediate future. Perhaps if I continue to write, my own style will develop. Or perhaps I will lose interest one day and move on to other things. Who knows? 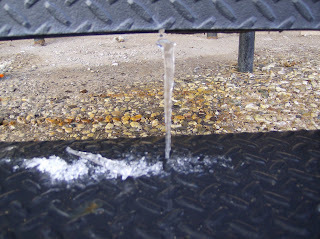 An icicle doing an impression of a stalagmite! 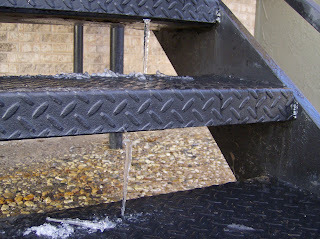 That's right, two icicles fell from the roof, landed upright on the stairs, one above the other, and stayed that way. This is certainly one of the more unusual sights I've seen in Lubbock. There was quite a bit of snow on the stairs earlier; I would suppose that the icicles stuck in the snow, which then melted when the sun shone on it, then re-froze since the temperature was actually never above freezing today! Leaving behind two well-placed, and odd-looking, icicles. My neighbours must have thought me mad when I came rushing out of the house, camera in hand, to take pictures of stairs. 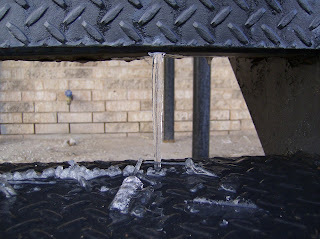 The photo above is also my photo of the day over at Lubbock Daily Photo; not a lot to see there as yet, but stay tuned!